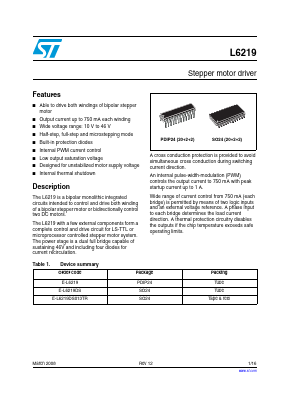 The L6219 is a bipolar monolithic integrated circuits intended to control and drive both winding of a bipolar stepper motor or bidirectionally control two DC motors. The L6219 with a few external components form a complete control and drive circuit for LS-TTL or microprocessor controlled stepper motor system. The power stage is a dual full bridge capable of sustaining 46V and including four diodes for current recirculation. A cross conduction protection is provided to avoid simultaneous cross conduction during switching current direction. An internal pulse-width-modulation (PWM) controls the output current to 750 mA with peak startup current up to 1 A. Wide range of current control from 750 mA (each bridge) is permitted by means of two logic inputs and an external voltage reference. A phase input to each bridge determines the load current direction. A thermal protection circuitry disables the outputs if the chip temperature exceeds safe operating limits.